Gget this Amazon bestseller today. It happens to all of us. We write down a list or box out two days one week to completely clean the house. It sounds great in the beginning, and we promise ourselves we'll get it all done. That day comes, and that seemingly small list of chores to do is suddenly a mile long. Never giving up, we push our way through the list, but before we know it, the day is over and only a few items got crossed off the list. 'Clean the oven' ended up taking 2 hours long, and 'clean the toilet' still isn't done because it's just gross. This scenario happens more than we like to admit. We may know how to clean something one way or guess how to clean something and hope it turns out, but what if there was a better way? This book features 25 proven and beloved strategies to clean items and areas around the home. They are simple, efficient, or quick and they are the best way to clean up without having to break the bank. Most of the cleaning solutions throughout this book are made with ingredients found in the average home. Most of them need only baking soda, vinegar, water, and dish soap. That being said, there are some cleaners that are just better purchased such as; Scent Blocking Floor Cleaner for Pets, or Saddle Soap. Luckily, most of these cleaners can be found at most stores and are usually pretty cheap. Each chapter will spotlight a different item or area found in most homes. You will get a list of the items and cleaners needed for the job at the very top and then a step-by-step method of cleaning that item or area. If there are different types of a certain item, like flooring or countertop materials, don't worry! This book will cover it all. In a few short chapters, you will be on your way to learning how to clean your home faster, easier, and better! Also, don't miss out on the very last chapter! It highlights some of the items that really NEED to be cleaned, but often get forgotten about. You also get a short and easy way on how to clean them. Overall, we are busy these days. We are working more hours, commuting further, and attending more events or activities. We get home to unload and still cook meals for our families. By the time everything is said and done, we're exhausted and promise we'll clean it later. In sort, our lives can get hectic and our homes tend to suffer. 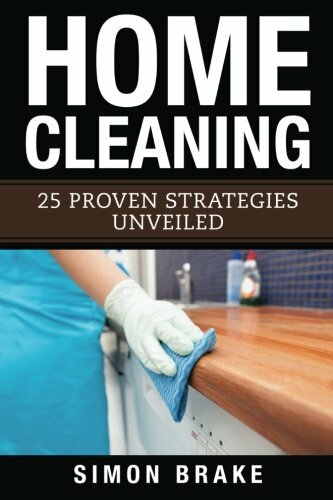 This book will show you how to clean your home more efficiently, and since most of the cleaners used in this book are something you usually have on hand, you won’t spend time driving into town to buy cleaners. After reading this book, you will be able to clean your home quickly and easily and have more time to spend doing what you want!